Independent learning activities are always a hit in my preschool class! We have been working on counting different kinds of things (besides just the numbers on the calendar) like frog jumps, egg shakes, bunny hops, ball bounces, and more! Each time, we use the same method. The kids have learned to point and count (or hop and count…shake and count…etc) so that the counting is meaningful and accurate. 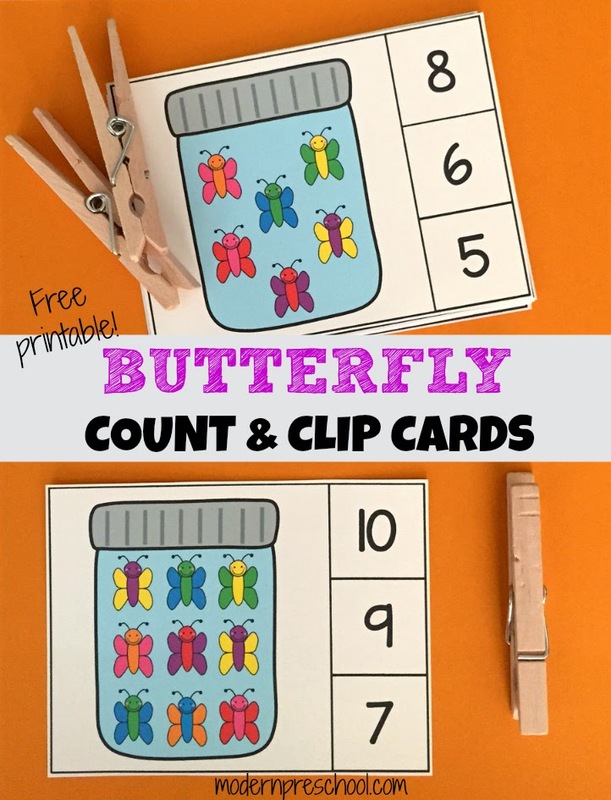 The Butterfly Count & Clip Cards are a fun activity to practice and reinforce 1:1 counting skills and number recognition. An added bonus is that little fine motor muscles are being strengthened too! Download the FREE PRINTABLE BUTTERFLY COUNT & CLIP CARDS at the end of the post! The printable set includes numbers 1-10. 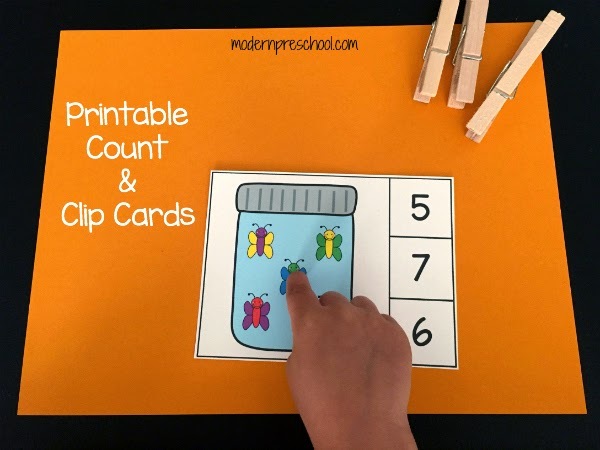 The count and clip cards can be used as a preschool busy bag, quiet time game, or an independent table learning center! Preschoolers who have mastered number recognition can practice meaningful counting. 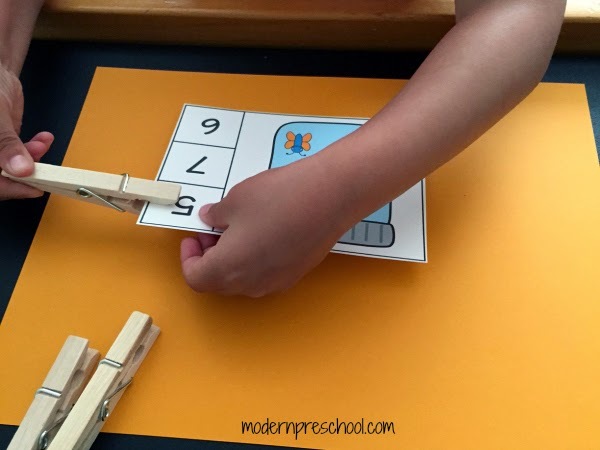 Those who have not mastered number recognition may need a partner to work with or a number line to refer to while playing with this activity. Keep the Butterfly Count & Clip Cards in a resealable freezer bag, a plastic pencil box, or a plastic pencil pouch with a zipper. Stuck in car line picking up your older child? Bring this activity with you to entertain your preschooler! Printable learning activity make life easier in the classroom and at home! Grab your copy of the butterfly count & clip cards now! These are so great! Both my 2 and 3 year olds are currently interested in counting everything. So these would be a fantastic activity for them. Thanks for sharing. Just popped over from the Tot school Gathering place. These are just brilliant. Thanks so much for sharing with the #pinitparty. Very cute activity! Pinned it. Stop by and share this at my Wonderful Wednesday Blog Hop this week please? My readers will LOVE it! I love these! You could even add stickers to the clothespins and the back of the cards to make them self-correcting. Lol! Yes. My computer autocorrects to yardstick. Thanks for finding that! Which font did you use to get the open #4?